Maradona, Beckham, Ronaldo, Alejandro Sanz, Rafa Nadal, Jose Mota ... are only some of the names who have "fallen" into the arms of the best public relations in Spain. Last year he published a book together with Eloy Arenas "El hombre que susurraba a los famosos”(“The Whisperer of the famous”). i-Marbella brings you an exclusive interview with the best Public Relations in Spain - Richy Castellanos. Born in Madrid in September 11, 1968, Richy Castellanos Ramirez, started playing football and dribbled his way next to the famous. He is the best public relations Spain and also a friend with most Spanish celebrities. Castellanos now leads his company Camarón Events since 1992, where his main task is to organize events and press conferences, mainly for VIPs, celebrities etc. The experience he has gained in the company, and all of his success during his long career has made Richy Castellanos the best Public Relations in the whole of Spain. Frank Sinatra, Michael Jackson, Robert De Niro, Cristiano Ronaldo, Joaquín Cortés, Diego Armando Maradona, David Beckham are just some of the VIPs who have spent time with him. In 2013 , Castellanos Richy has published a book entitled "The Whisperer of the famous" (Editorial Planeta), written together with Eloy Arenas. Has was also recently honored by the Society Performers of Spain, Europe and America (IEA) for his 22 years of experience and more than 3.000 events held. The best sculptor in the world, Santiago Santiago, gave him a life-size bust, which was delivered by Alex de la Iglesia, Jose Mota and Santiago Segura. The professionalism, experience and reliability that describes Camarón Eventos and the passion and commitment that Richy Castellanos brings is why the most famous people in Spain trust him when organising an event. 1. How did you get into Public Relations? When I was small I collected stickers of football players, and I liked the champions like Pele, Maradona also in other fields ... I liked Marilyn Monroe, Bruce Lee, Michael Jackson and because I liked football and I also played in the Real Madrid Children's category. But unfortunately I had to hang up my boots due to an injury and so I got into the difficult world of the show business and I have been here 22 years so far with over 3000 events organised. 2. Where did you get the knowledge of PR business? I learned on the street. And my teacher's was my father Ricardo, and his advice for public relations was to “find the beans on the street”. As like my good friend Paco Lucia said I dont know anything about anything, but i know something about what i do. 3. You are also closely related to the world of football, especially to Maradona. How did you become so close? When I was reading the newspaper they were already talking about a guy who was a genius with the ball at the age of 14. And his name was Diego Armando Maradona. Through the media I followed his career and when I saw him touching the ball it was like Walt Disney cartoons. It impressed me so much that in 1993 thanks to my friend the former Barcelona FC player Marcos Alonso I introduced myself to Diego. 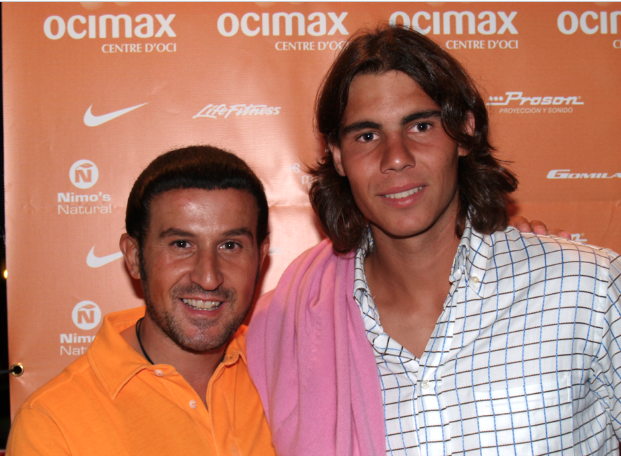 And since that day I remained friends with him and he is still my idol and the best player of all time. 4. You have a famous line called “Zero point zero”, what does that mean? Always have to give to the artist and not ask, I patent the 0.0 which is giving him the best of what is good with a cost 0.0. I also have to guess what the artist wants without asking him, in the end he thanks you because most of the people that want to be close to the artist is to ask sometimes or sometimes to cheat. 5. Do the celebrities you work with trust you with everything? How do you gain their trust? From the beginning of the career, the celebrities know what to talk about with who, since the word of mouth is the best language and message for everybody. But having me as a public relations is also having a great friend who keeps intimacies of the celebrity to himself and I have always said that I prefer a friend, rather than an enemy. 6. What have you learned from the celebrities, being so close to them? I have learned a lot. By listening, live up to them without standing out and not to harm anyone. They believe in me and have the confidence that what we say or what I see is saved in my heart. 7 . Of all the celebrities you have worked for, who has influenced you the most and how? The artist who has impressed me most?? There are several - Paco de Lucía, Maradona, Javier Bardem and many others. 8. You have a museum in your office, what are the most important objects there for you? For me all the gifts I have received are important, but I love the guitar of Paco de Lucia, boots from Joaquín Cortés, shirt from Maradona and the racket from Rafa Nadal a lot! 9. What is the secret of your success? My success is because of perseverance and tenacity. And after 22 years in the business want to be here another 30 years organizing events in all 5 continents. 10. What is the most important moment in your career that you look back to? I think the day that I received the award for Spain's best society artists of Europe. That meant all the world to me and was given to me by three geniuses - José Mota, Alex de la Iglesia and Santiago. The second prize was given to be by Luis Cobos, the president of artists in Europe Jose Merce and by the actor Alex Gonzalez - a picture where I was portrayed by the internationally renowned painter Nati Cañada, who also has painted the King of Spain, Michael Jackson, Tony Curtis and Placido Domingo. 11. What would you recommend to someone who is dreaming of your career? How can they achieve what you have? By studying in the university? I recommend patience and tenacity, to have a personality and believe in yourself so that others can believe in you too. 12. What are your plans for the summer and overall for the future? Will you come to work in Marbella as well? My plans are always the same - to spend time in my second house, which I have had for 25 years and where I have spent the summers in.. It is in Marbella and there is the best climate in the world! And I have lots of friends there, like Juan Sánchez from restaurant Mari, the beautiful super professional Carmen Souza and director of Finca Besaya, Armando. Being there with my family, relaxing, doing sports and sunbathing is the best.